Designing stairs has been our passion for over 25 years. We have managed to create thousands of unique sets during this time. Each one is made from the highest-quality materials. We always take care of all the details at every level of production. We know how important it is for stairs to be functional and to look extraordinarily. This is what makes them a special part of your house. 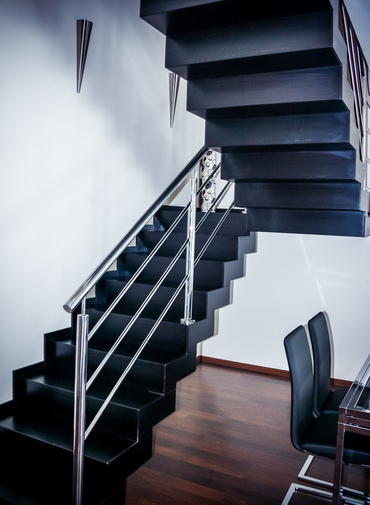 We are able to build every kind of stairs you can dream of: winder, spiral or arched stairs, outdoor or indoor ones, but also the stairs made out of wood, steel or glass. We know that everyday you are going to make a thousand steps on them. That is why we are going to help you choose the model that will meet your expectations and then every step you will make will be a pleasure. Moreover, we offer to build original wooden, wrouught iron, steel or glass railings. Usually we propose the handrails made from wood, but also we can make them from stainless steel or wrought iron, if wanted. We are ready to accept new challanges. All individual clients, architects and property developers are invited to contact us. Do you want to create your stairs with us? Call, write and come to our office in Reda, which is placed in the nothern Poland. All clients from Gdansk, Gdynia, Sopot and the rest of Poland are welcome to come.